Creativity is a process, not a product. You begin in places you don't understand as beginnings. You circle around, gathering experiences and insights. Over time, you spin: a tale, a product, a satisfying life. Sometimes your "outcome" is simple enjoyment of the process itself. Sometimes it is the realization of a dream or the building of a business. You decide. Or the structure of your life decides. In Spin: Taking Your Creativity to the Nth Degree, you'll get inside the process of a productivity expert who understands both the mysterious and technical natures of creativity. Lively memoir reveals the mystery, while numerous exercises and helpful lists like "12 Ways of Capturing Creativity on the Go" and "How to Break Down a Large Creative Idea" make creativity something you can decide to structure for specific outcomes. 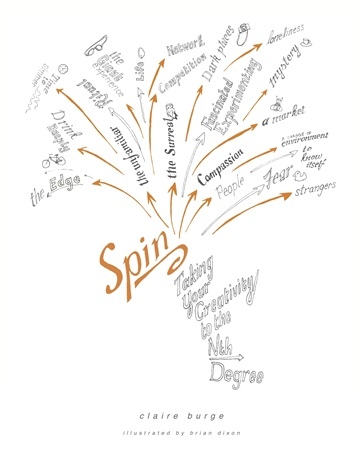 Filled with surprising, thoughtful, often amusing stories, and illustrated from journal-sized cover to cover, Spin will delightfully give you what you need—to take your creativity to the nth degree. This pdf excerpt of Spin is 1/3 of the book, compressed to make it possible to download, which results in minor reduction of the illustrations' resolution. A talisman on your creative journey. Grab a copy and keep it close. It will be your friend for life. If creativity needs people, it needs more people like Claire Burge. By opening doors to her intimate stories of discovery and self-reflection, she gives you a set of keys to unlock your own creativity. This book will awaken the creative giant within you and push you to explore your world with boldness and audacity. A delightful tale of whimsy and courage. Burge reminds us to find joy, creativity, and passion in our everyday lives.